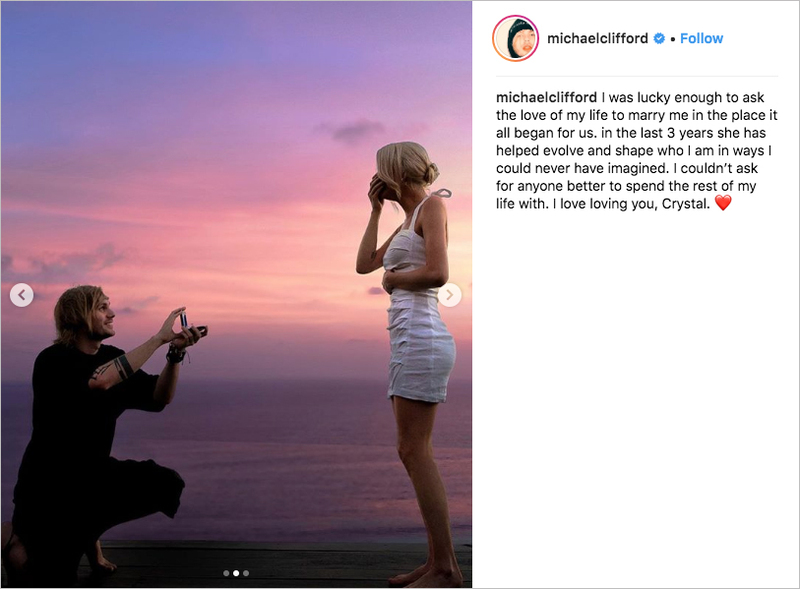 Home > Celebrity Style > Michael Clifford from 5 Seconds of Summer Is Engaged! 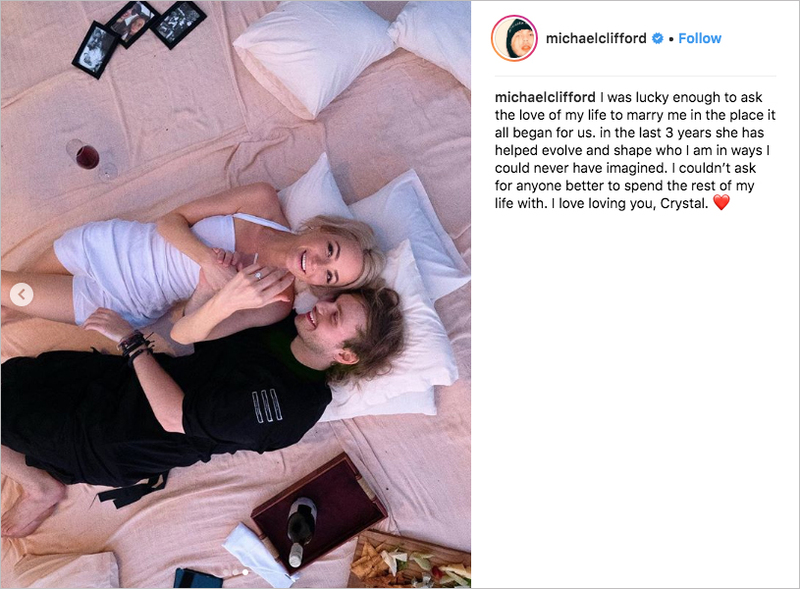 Michael Clifford from 5 Seconds of Summer Is Engaged! See the band member's romantic proposal to Crystal Leigh. 2018 was a big year for 5 Seconds of Summer, but 2019 might be an even better one for the band’s lead guitarist, Michael Clifford. He got engaged to his girlfriend of three years, fashion influencer Crystal Leigh. While it appears the proposal tied in with a campaign the couple did with Guess that sent them to Bali with some of their close friends, that doesn’t mean the moment was lacking in sentiment. Bali happens to be where the lovebirds first met, and Us Weekly reports that Michael made sure “Medicine” by The 1975 was playing when he popped the question, as the same song played when he and Crystal shared their first kiss. A gorgeous sunset filled the sky with pink and purple as he dropped to one knee and presented the oval diamond engagement ring. The sweethearts also enjoyed a picnic with photos from their relationship, a charcuterie board, and wine. Fittingly, the new bride-to-be was wearing a white dress for the occasion. The mini frock featured a straight neckline and halter straps, though we expect Crystal’s eventual wedding dress will have a different style. The blonde beauty has also had pink and purple locks in the past, so we can’t wait to see what she chooses to do with her hair for the big day. 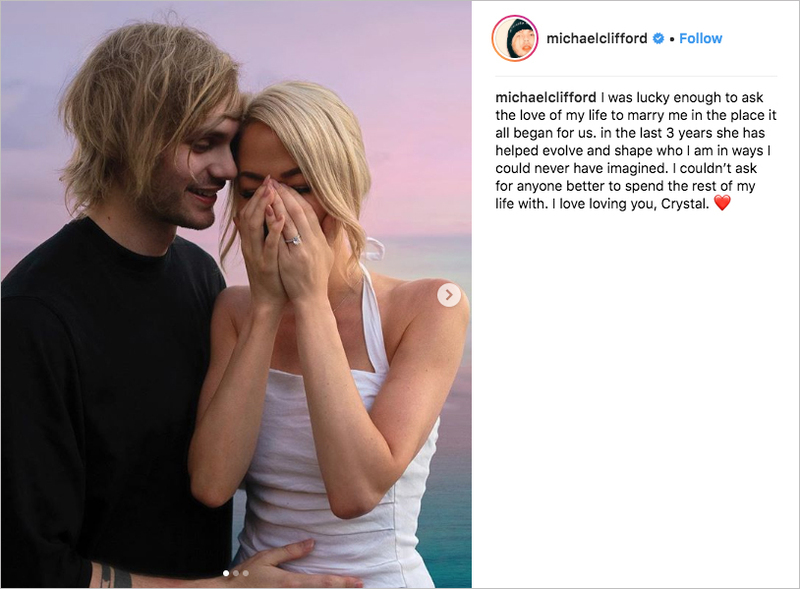 Learn more about the recent engagements of Michael Clifford's fellow musicians: Josh Dun of Twenty One Pilots to actress Debby Ryan and Tom Kaulitz of Tokio Hotel to supermodel Heidi Klum.